Mike battled lymphoma for several months and defeated cancer. With a new appreciation for life, he switched his unhealthy habits for the real fountain of youth! I had a few reasons to change my body and my life. In 2001, I was diagnosed with cancer (lymphoma). After four operations and six months of chemo I started getting better. In 2005, the doctors said the cancer was in remission and I was a cancer survivor. 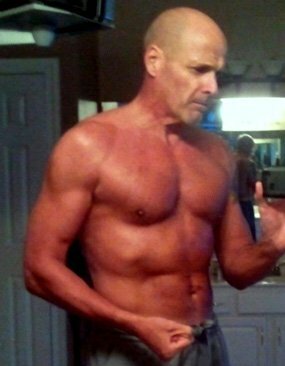 After defeating cancer, I partied pretty hard for a few years, had bad nutrition, and didn't exercise. During a recent physical, I was told my cholesterol and blood pressure was too high and I had to lose weight and quit smoking cigars. The doctor said: "You beat cancer, but now you're going to kill yourself with this lifestyle." When I first made the commitment to change my diet and add exercise no one thought I was serious. 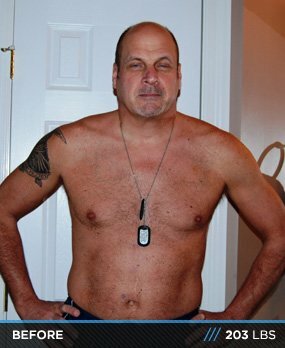 Now, after two years of my healthy lifestyle, my family and friends are amazed and supportive. Nutrition was a large part of the change. My wife and I cleaned out the pantry and removed the processed chips, cookies, cereal, and junk food. We replaced those items with fresh and healthy products. People say that I'm obsessed with nutrition and working out. My response is to look at my before and after photos. I'm not going backwards. My energy levels increased after the first three months and now look forward to future doctor visits. Bodybuilding.com educated me on exercise, health, and nutrition. I followed the workouts and nutrition plan religiously for 12 months. Then, with the help of Bodybuilding.com, I modified my routine. I incorporated more weightlifting and bought a used Olympic weight set and bench. I have a wonderfully supportive wife. She helps me with nutrition by stocking the kitchen with healthy foods. 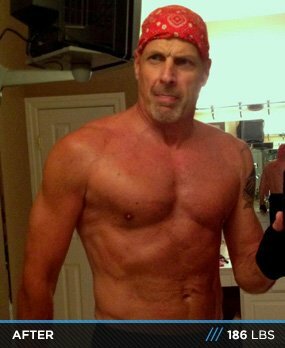 Getting in shape at 56 isn't easy. I couldn't move without aches and pains from a tough workout for the first several months. Even now, some two years later, I still have days when my subconscious tries to talk me out of the day's workout. One motivation for me is to go to Bodybuilding.com and look at We 'Mirin physiques. That will get you off the couch and moving. Those folks are ripped. I set several goals for myself and strove to reach each of them; six pack abs, single-digit body fat, and more pull-ups. My diet has been clean for two years; I'm committed to working out and eating right. Exercise and nutrition is the true fountain of youth. I read a number of really good articles on Bodybuilding.com about supplements. The site makes nutrition research as easy as point-and-click. I'm a hard-gainer (ectomorph), so in my opinion, adding supplements helps. I see increased energy while gaining lean muscle mass. Nutrition is a large part of my transformation. Learning to eat 5-6 meals per day was foreign to me. After reading articles on Bodybuiding.com by Obi Obadike, Shannon Clark, Chicken Tuna, and others, it started to make sense. I now see food as fuel and think about macronutrients. Drinking water and staying hydrated is a real key. I drink about 64 ounces of water per day. I eat 1500-1800 calories per day made up of 40 percent protein, 40 percent carbohydrates, and 20 percent fats. Completely changing my diet to clean and simple nutrition was a tough adjustment and scheduling workouts every evening and weekend was a challenge. However, like any habit, 30 days into my new routine and I was set. I hope to keep moving forward. There's nothing like the endorphin and dopamine rush of a good workout. 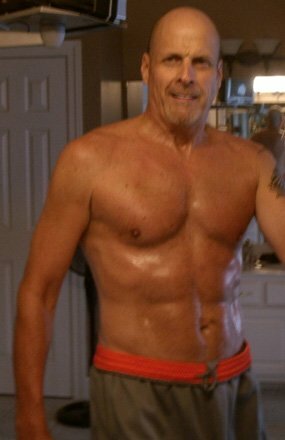 Health and fitness is my overall motivation, but I like the idea of aging with physical confidence. Perhaps one day I can train my fellow seniors. I just read a news story about 93-year-old English Doctor Charles Eugster. He works out four days per week for 60 minutes. At a recent championship, he achieved 57 dips, 61 chin-ups, 50 push-ups, and 48 abdominal crunches. Dr. Eugster says he does it for the young 70-year-old gals on the beach. I like this guy's style. If I can do it, I'm certain others can too. You need the right mindset. It takes motivation to get off the couch and take the first step. Start small but set lofty goals. Track your progress and remember: "It's hard to score if you don't keep score." Find a workout partner and keep each other on track. Use Bodybuilding.com to find answers to your fitness and nutrition questions. If you've already started transforming, keep striving to mix it up. Do extra reps, faster times, heavier weight, and different workouts. Challenge yourself to keep your workouts fun. Bodybuilding.com is the ultimate website. It's always fresh and updated. You can search and locate many great articles in the archives. I like the features by Kris Gethin, Jim Stoppani, and others. They taught me to work out with weights. Nutrition is 75 percent of a transformation. Through the many stories on Bodybuilding.com, you can learn about diets, essential nutrition, and use the tools and calculators. Save the website, bookmark it, and use it. It's hard to believe it's all free.